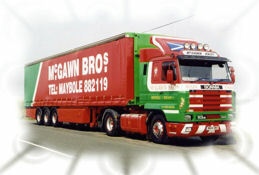 McGawn Bros was founded in 1964 by David and James McGawn. When McGawn Bros was founded, we were making wrought iron gates in a garden shed in Ayr. After a year, we moved to a yard in Maybole and in 1968 decided to branch into the world of haulage and bought our first unit and trailer. 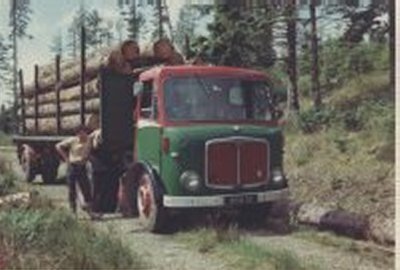 This was used to haul timber from Argyll to Workington for a local sawmill who we still do some work for. We carried on making gates until 1975, by which time the fleet had grown to six vehicles. In 1977 we moved to our present site in Alloway Road where we have our offices, workshop and 26,000 sq ft of warehousing. We also have another 18,000 sq ft at Ladywell Terrace, also in Maybole. At present our fleet consists of 11 Scania tractor units coupled to tri-axled flat and curtainsided trailers, depending on our customers needs.